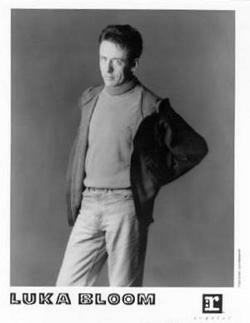 Luka Bloom's debut album Riverside - was recorded in New York and, in a way, it was about New York. In New York City Luka made friends, built his following and found a record deal. With songs like "Hudson Lady" and "Irishman In Chinatown", he described his experiences here, real and imagined. And, with "Dreams In America", he told us what it was like to be so far from home. On The Acoustic Motorbike he returns home, literally and musically. It's as much a record about Dublin in 1991 as Riverside was about New York City, 1989. The Dublin he returned to was full of creative energy - lots of good bands, American movie crews invading all the cool-looking streets and a general air that something exciting was happening. Luka decides to record the album in STS Studio, a funky three-story walk-up in a part of town called Temple Bar, a neighborhood that has been called Dublin's Left Bank. I must admit I was skeptical when I saw the place; the moment you walked in you knew you weren't in New York or Los Angeles. U2 had just left there and, after I'd spent a few days in the studio, I could see why they liked it as much as Luka did. It was a place where you could perform, not just record; where you could invite a few musicians up and discover whole new ways to arrange a song right on the spot; where the people watching you through the control room glass seemed like family and friends, not just hired hands. In that environment, Luka recorded some of his most assured, most intimate, most spontaneous performances. The mood he manages to create on stage has translated effortlessly into that small studio, and that is very evident on "The Acoustic Motorbike". Luka brought with him the lessons he learned in New York. He fell in love with a lot of the rap music he heard in the States and that's reflected in the very Irish - and very funny - rap on "Acoustic Motorbike" and, of course, in his utterly original reworking of L.L. Cool J's "I Need Love". That tune deftly blends New York and Dublin with, on the one hand, state-of-the-art drum machines and, on the other, his brother and esteemed Irish folk singer, Christy Moore, playing the tradition Bodhran. Luka recently shot a video in New York City with director Katherine Dieckmann, who did R.E.M. 's "Stand" and "Shiny, Happy People". "The Acoustic Motorbike" features several other Irish musicians, including the Hothouse Flowers, who accompany Luka on his late night live-in-the-studio version of "Can't Help Falling In Love". There's a lot of lovely, traditional Irish instrumentation on "The Acoustic Motorbike", but there's plenty of hardedged electric guitar too (courtesy of Ed Tomney, who also played on "Riverside"). The album is full of potent pop music fueled by the imagination, played by hard-working human hands. It's like the story Luka tells in the title track: "The Acoustic Motorbike" is a journey, but getting there is half the fun. And this is just a way of telling you how Luka got there. As for where he's going next - well, you'll be seeing him in your town pretty soon.